Boys and Girls Clubs of Santa Cruz County > Club News > Alumni > Are You a Boys & Girls Club of Santa Cruz Alumnus? Are You a Boys & Girls Club of Santa Cruz Alumnus? 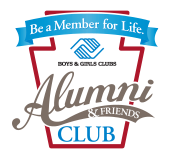 The national Boys & Girls Club of America is launching an Alumni & Friends membership campaign. For every new member who joins the Alumni & Friends Club in September, a Boys & Girls Club membership will be donated for a kid in need. Join today as an Alum: visit to learn more about the new Alumni & Friends Club.